No American president has probably touched the lives of so many outside in a positive way than Jimmy Carter – the 39th president. For the past three decades, since leaving the White House, he has been a resolute voice for human rights and democracy. It was for such activism in the world arena that the Nobel Committee honored him as the recipient of the Nobel Prize for Peace in 2002, the only U.S. President to have received the Prize after leaving office. To most of his admirers he genuinely deserved the award, something that cannot be said of President Obama, who was awarded the prize in 2009. President Carter is very vocal about the Palestine-Israel conflict and believes that the USA has a strong role in any peace effort involving the Middle East. Is America ready to play its historic role for peace-making? Can it be trusted by all the parties to the dispute? 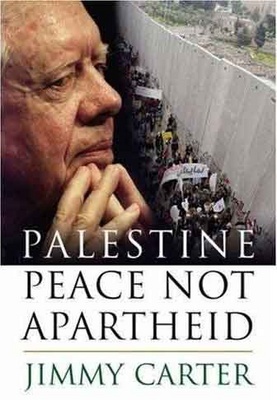 President Carter’s book “Palestine Peace Not Apartheid” makes it abundantly clear that America has failed in that task rather miserably. Still, his observation is right. After all, the USA has been Israel’s greatest benefactor since the Jewish state was recognized by President Truman. Had it not been for America’s economic aid and security guarantees, plus the abuse of the veto power inside the UN Security Council, the rogue state would have long been a distant memory, much like the short-lived crusader state in the 12th century. In October 2003, seeing no progress with the “Roadmap”, with involvement of the Carter Center, a final draft for a new initiative was concluded, which was later disclosed by Carter in Geneva. A majority of the Israelis and Palestinians approved the Geneva principles, despite strong opposition from some top political leaders. Sharon condemned the Geneva Initiative and there was silence from the White House, but Secretary Powell supported the Initiative and met with key negotiators – Yasser Abed Rabbo and Yossi Beilin. (p. 167) Later George W. Bush, a born-again Christian, mindful of not repeating his father’s “mistakes” (in chiding the Jewish state), had no interest in any peaceful resolution of the conflict. Taking advantage of diplomatic vacuum left by GW Bush, Israeli prime minister Ariel Sharon came up with a unilateral decision to encircle Palestinians by constructing a wall that’s at least 3.5 times Israel’s international recognized border. According to Carter, the wall effectively divided Palestinian villages, separating the farmers from their fields, and not just separating Palestinians from Jews but rather Palestinians from Palestinians. (pp. 189-194) He observes, “There has been a determined and remarkably effective effort to isolate settlers from Palestinians, so that a Jewish family can commute from Jerusalem to their highly subsidized home deep in the West Bank on roads from which others are excluded, without ever coming in contact with any facet of Arab life.” (p. 190) In July 2004, the International Court of Justice determined that the wall was illegal and called on Israel to cease construction of the wall, to dismantle what has already been built in areas beyond Israel’s international recognized border, and to compensate Palestinians who have suffered as a result of the wall’s construction. But Israel has ignored the ICJ verdict. According to Carter, from September 2000 until March 2006 (before the book went for publication), some 3,982 Palestinians and 1,084 Israelis were killed in the second Intifada and these numbers include many children: 708 Palestinians and 123 Israelis (p. 206). President GW Bush shares great responsibility for letting such massacre to continue. The question of land – who owned what percent before the infamous Partition plan was announced in 1947 – is very important to understand the root cause of the ensuing conflict. Zionist leaders have always claimed that the Partition plan in which the Jews were given a bigger share of the pie was fair. Land records, however, show that Jewish ownership was only 2.5% of the land before Israel declared its independence in 1948. Carter reminds us that in 1880 there were only 30,000 Jews in Palestine, scattered among 600,000 Muslims and Christian Arabs. When Britain conducted a census in Palestine in 1922, there were about 84,000 Jews and 670,000 Arabs, of whom 71,000 were Christians. By 1930, thanks to the British policy on Jewish immigration from Europe to Palestine, their numbers had grown to more than 150,000 (p. 65). By the time the area was partitioned by the UN, these numbers had grown to about 600,000 Jews and 1.3 million Arabs, 10 percent of whom were Christians (p. 58). That is, there were two Palestinians for every Jew, and yet, the Jews were given 56% of the land! It does not require a genius to understand the reasons behind Arab rejection of the unfair plan. As a result of the war of 1948, more than 710,000 unarmed Palestinians were expelled by the Zionist terrorists from their ancestral land. The return of these refugees and their children and grandchildren, born in Diaspora, now remains a serious bone of contention. Israel is adamant about disallowing return of the Palestinian refugees while it remains open to Jewish immigration from anywhere in the world to the holy land. Carter reminds us that by 1964 when the PLO was formally organized, there were, according to the UN estimate, 1.3 million Palestinian refugees, with one-fourth in Jordan, about 150,000 each in Lebanon and Syria, and most of others in West Bank and Gaza refugee camps (p. 58). Nor should we forget that when Israel launched pre-emptive strikes on June 5, 1967 and within six days occupied the Golan Heights, Gaza, the Sinai, Jerusalem, and the West Bank another 320,000 Arabs were forced to leave the additional areas in Syria, Egypt, Jordan, and Palestine that were occupied by Israel. A number of UN resolutions were adopted with U.S. support and Israeli approval, reemphasizing the inadmissibility of acquisition of land by force, calling for Israeli withdrawal from occupied territories, and urging that the more needy and deserving refugees be repatriated to their former homes (p. 59). Well, such shocking revelations may sound unbelievable, but fact remains that Israel has never been serious about letting Palestinians live in an independent state of their own. Access to water, e.g., remains a persistent issue. Each Israeli settler uses five times as much water as a Palestinian neighbor, who must pay four times as much per gallon. There are Israeli swimming pools adjacent to Palestinian villages where drinking water had to be hauled in on tanker trucks and dispensed by the bucketful. Most of the hilltop settlements are on small areas of land, so untreated sewage is discharged into the surrounding fields and villages (p. 121). Only in an apartheid state can one expect to see such outright discrimination and harassment of a people! Israeli state policy forces exodus upon the Palestinian people. In 1948 there were 90,000 natives in Gaza. The population more than tripled by 1967, and there are now more than 1.4 million – 3,700 people living per sq. km, making it one of the most densely populated places in our planet. Israel does not allow air and sea transportation from Gaza. Carter observed that fishermen were not allowed to leave the harbor, workers were prevented form going to outside jobs, the import or export of food and other goods was severely restricted and often cut off completely and the police, teachers, nurses, and social workers were deprived of salaries. Per capita income decreased 40% during 2004-06, and poverty rate reached 70% (pp. 175-6). This was the situation before reinvasion of Gaza in July 2006 and its latest demolition in December 2008 – January 2009 by the IDF (during the last days of the Bush administration). There is no denying that the unwavering support of the US government has emboldened the Israeli leaders to believe that they are above the international law and have the right to confiscate and colonize Palestinian land, and sustain subjugation and persecution of increasingly hopeless and aggravated Palestinians. The latter see that suicidal activities are ways to shorten their pathetic condition. This madness on both sides must come to an end. Carter concludes, “Peace will come to Israel and the Middle East only when the Israeli government is willing to comply with international law… It will be a tragedy – for the Israelis, the Palestinians, and the world – if peace is rejected and a system of oppression, apartheid, and sustained violence is permitted to prevail.” (p. 216) He is absolutely right. Palestine Peace Not Apartheid is a courageous work of a man who is sincere about finding peace in one of the most troubled areas of our world. President Carter has visited the Occupied Territories many times and has firsthand knowledge about America’s failed and half-hearted diplomatic initiatives in the Middle East. I strongly recommend this book to anyone serious about understanding the root of the Palestine-Israel conflict and the fallacy of the American ‘balanced’ diplomacy in the Middle East. This article is excellent! Not only is every assertion in this blog true, it also shows the immoral biases and subservient lies engaged in by the great powers that keep this egregious state of affairs going.